I had actually started editing photos for another subject this evening, and was just casually scrolling back through my photo folder when I stumbled across these, which I’d taken on the weekend. I can’t believe I’d forgotten about them already! Well. Naturally, I had to switch post topics. The original photos will be for tomorrow, instead. This guy was a bit of a surprise. I’d given the animals their dinner, and once they’re done eating they have a routine of liking to go out onto the screened-in porch to check out the happenings out there. Merlin seemed a little more eager than usual to go out, but I thought nothing of it. I opened the door for him, and he trotted out briskly, followed quickly by Oliver and Charlie, and then as I continued to hold the door open, Raven darted out, too. Just as I was wondering about Raven’s interest in the porch (she normally shows no interest – why go out there, when she could go out the front door and be able to roam the whole yard?) I heard a squeaking coming from the far corner. I stepped outside just in time to see a Red Squirrel dash up the screening to the thin ledge just above it that the decorative framing creates. Goodness knows how he got in. Or why. More than likely he somehow discovered that we store our birdseed on the porch, and just recently we’d had the lid off the container for a stretch. The only way I can conceive of him getting in at it, though, is there’s a small gap in the screening at one end where it’s worked its way loose from the frame. He must have pushed his way through that. Unless there’s a hole in the floor I don’t know about. The cats went straight into stalking mode, and I had a bit of a struggle getting them rounded up and back inside. Then I propped open the door leading outside, and went back in to finish preparing the humans’ dinner. Half an hour later he still hadn’t left, and I finally had to herd him outside. He jumped from the top of the door and landed hard on the cement walkway. 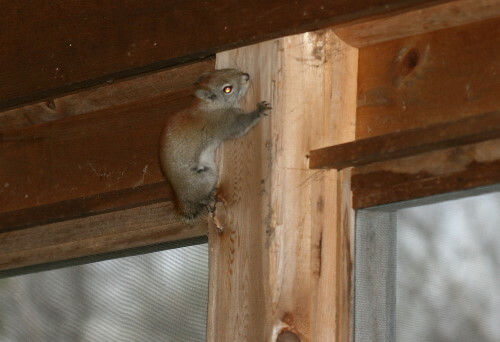 He scampered off alright, so I hope he didn’t hurt himself. 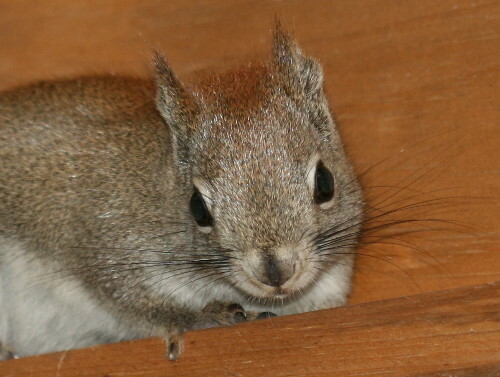 It’s a little funny that we even have Red Squirrels around the house. During the day Raven is free to patrol outside, and generally speaking she does a good job keeping all the little varmints (her word, not mine) at bay. 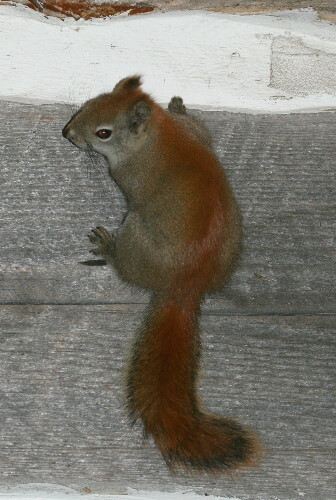 The Red Squirrels, though – they’re bold. I regularly see one scampering along the outside of the shed (actually the original farmhouse, so it’s a little one-and-a-half-storey building), and I have a suspicion it might have a nest inside; they will occasionally opportunistically nest in human structures. There are cracks in the chinking where it can slip through, and, for whatever reason, a fair bit of foam padding stored in the upper level. Would make a great place for a nest, especially considering how conveniently close it is to the birdfeeder. And no durn dog is gonna persuade it otherwise. In a more natural setting Red Squirrels will build their nests out of grass in the branches of a spruce tree (which we also have plenty of around the house), but are not opposed to using cavities or even excavating out large knots of witch’s broom. A typical territory is only about 50 m (164 ft) wide, providing there is sufficient food available, and a Red Squirrel may have multiple nests within the territory that it will switch between when it’s feeling like a change of scenery. Herding both cats and squirrels all in one day, eh? Well, it seems worth the trouble as you got some real nice shot here—especially that second one. They’re charming critters with major personalities. Thanks for the post. Awwww. Love that second picture. 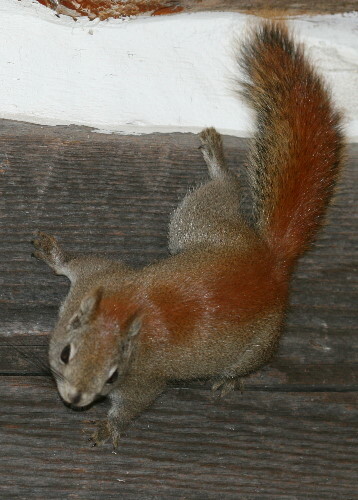 I’ve never seen a red squirrel. Very nice. Too cute! And good that you discovered the visitor. I can just imagine the ensuing mayhem if you hadn’t.